I realized something today. Well, actually last week when I made these cheesecakes: I love my job. I love that I get to bake, eat and repeat every. single. day. I also realized I don’t bake cheesecakes nearly enough! I was asked by PHILADELPHIA Cream cheese to be a part of their “Bring out the Silver” campaign this Easter. PHILADELPHIA cream cheese…silver packages…bring out the silver. Get it? I prefer to only use “the silver” when baking cheesecakes. I’ve used off brands, and they just don’t have the same texture. Did you know PHILADELPHIA Cream cheese has been around since 1872? I would say that has given them plenty of time to perfect America’s favorite cream cheese! Their cream cheese (bricks) are made with fresh local milk and real cream, no preservatives and only real ingredients! Quite important if you want fresh, wholesome, real cream cheese taste! It also doesn’t sit around being “processed.” It goes from farm to fridge in 6 days. No wonder my cheesecakes come out perfect when I use PHILADELPHIA!! 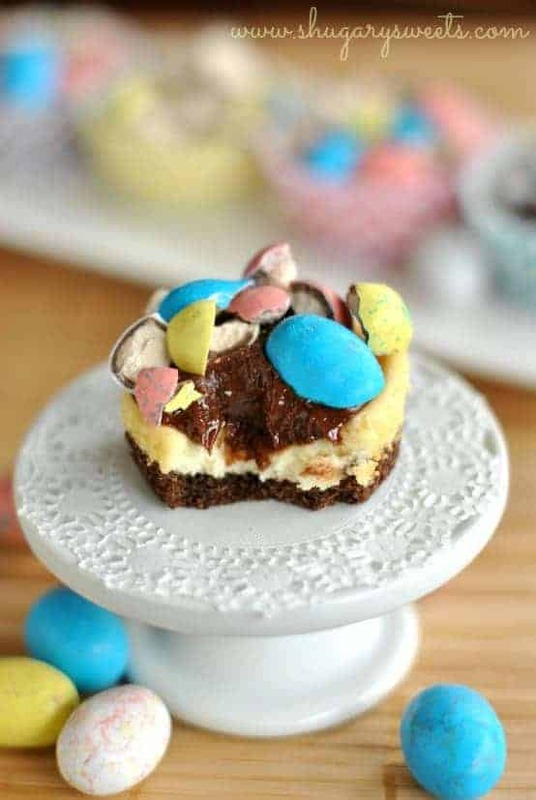 This Easter, why not try making these delicious, Malt Ball Mini Cheesecakes? The crust is made using chocolate graham crackers. I added some malted milk powder to the crust and the cheesecake filling. I topped each mini cheesecake with some chocolate ganache and some broken malted milk balls. I’m pretty sure these are my favorite cheesecakes ever! how will YOU use PHILADELPHIA cream cheese this holiday? In a food processor, pulse graham crackers until fine crumbs. Pulse in the malted milk powder and sugar. Using a fork, mix in the melted butter. Spoon about one tablespoon of crust into the bottom of 20-24 paper lined muffin cups. Press into bottom of paper liner using a tart shaper or bottom of cup. Set aside. In a large mixing bowl, beat cream cheese, sugar, and vanilla on high for about 2 minutes. Add eggs one at a time, beating until fully incorporated. Beat in malted milk powder. Spoon filling into muffin cups until 2/3 full. Bake in a 350 degree oven for 25-30 minutes. Remove and cool on wire rack. When cooled, begin ganache. In a glass bowl, add heavy cream and microwave for 30 seconds, until warm. Add milk chocolate and heat an additional 60 seconds, stirring until smooth. Spoon about 1-2Tbsp onto each cooled cheesecake. Top with chopped malted milk balls. Refrigerate 2 hours or more, covered. ENJOY. Ever wonder why your cheesecakes don’t come out picture perfect? Here are some tips and tricks from the chefs at the PHILADELPHIA Cream Cheese kitchens (seriously, who wouldn’t want that job? I’d be happy to just visit and taste test for a weekend)!! Prep it Right: Set out ingredients about 10 minutes before baking to work with them at room temperature. Allow your oven to preheat while preparing your filling. Be Gentle: Do not over-beat. Over-stirring can add too much air into the batter, which can cause cheesecake to crack. Beat in eggs, one at time, on low speed until just blended. Practice Patience: Don’t peek! Opening the oven door while cheesecake is baking causes drafts that may lead to cracking. Loosen Up: Another way to prevent cracking is to immediately run a knife around the edge of the cheesecake after baking to loosen it from the sides of the pan. 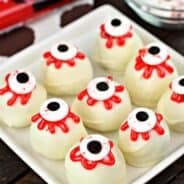 Recipe created by Shugary Sweets. For more recipes, go to creamcheese.com. Want more mini cheesecake recipe ideas? Check out some of these wonderful bloggers and their mouthwatering recipes…. Aimee, I just saw these on FB…what a beautiful, Easter-y, springy treat to wake up to on my computer screen! I’m not a big candy eater, but love malt balls and of course cheesecake. These are just wonderful! Oh I just want to pop these little guys right into my mouth! I love the “mini” aspect. Everyone gets their own…and you can eat as many as you want. Great tips too. I’m the worst about peeking! So pretty! I wish I had time to make these for my Easter dinner. Just may have to make them after hahaha. Love the tips you shared and yes the “silver” cream cheese is the best to use for anything requiring it. Off brands aren’t as creamy and I think the consistency isn’t the same either. Let’s be cheesecake bffs forever mmmmmmkay? Bake, eat, repeat…sounds fantastic! I love blogging too…now if only I could quit my daytime job then I’d be set. But I’m with you in that I don’t make cheesecake nearly enough. Every time I eat it I tell myself to make it more often, and then I somehow always forget. These mini cheesecakes look delicious. 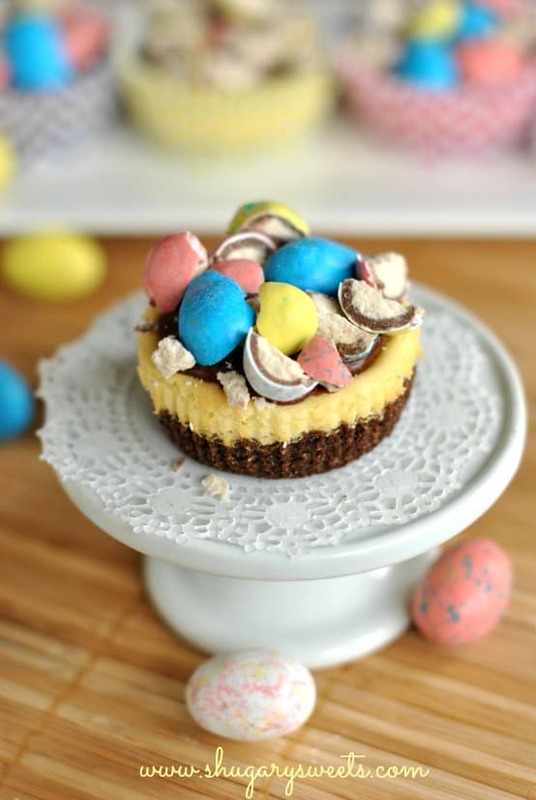 Loving the chocolate graham cracker and malted powder crust and malt ball eggs on top! Thanks Elaine 🙂 They were quite tasty, and I hear ya on the forgetting…so many other goodies to make! I LOVE malted milk balls…especially the Easter egg ones. Love this idea…looks so scrumptious! The ganache on this. Oh yes. Best motto ever…Bake. Eat. Repeat. 🙂 Cheesecake really should be it’s own food group because it is so dang delicious!!! I love how pretty and spring like your pictures are!!! Thanks for the sweet comment girlie. Love cheesecake and ganache! I always make cheesecake on Easter. Maybe this year I will add a layer of ganache to the top! And I always use Philadelphia. You are right, store brands just are not the same. I was going to do something with malted eggs too, but since I’m down in Texas right now and the produce is so fresh, I decided to take advantage of it! I love your creation…especially the ganache! Yum! Love your cheesecakes, good choice going with the fresh produce!!! Those look perfect for Easter Aimee! I love malt balls and chocolate ganache….so gooood! These cheesecakes look fantastic! I love that they are bite-sized so I wouldn’t have to bake an entire springform pan and take up valuable refrigerator space. Yum! So festive and pretty! Can’t go wrong with cute little cheesecakes! And yes, I did know G.Reader is disappearing and I’ve tried other services and found one I like but as you said, following in other places will be important! Oh if I had some left, YES. Your turtle version looks to die for!!! Can’t go wrong with malted milk balls and chocolate ganache!! You’re killing me here with my favorite robin eggs and chocolate ganache and cheesecake! I’m making these some time for sure. I want one right now! Are these regular cupcake size or mini? Thanks! Between you and Katrina, now I need to get a bag of candy eggs! Such a fun idea. Love the fact that you used chocolate as the base for this one. Everything is so much better with chocolate. Then add the malt and you are good to go! Well ok then! 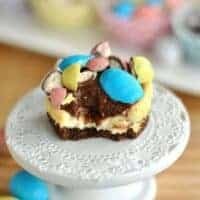 This is the dessert I’m making for Easter! If I don’t use my Robin’s Eggs in a recipe I will eat the entire bag and that would be bad! The ganache is killer! Great photo! I have been using blogilovin as well and I like it! These cheesecakes are spectacular- I love me some cheesecake! I wish this was my job and I could bake. eat. repeat! Mine is more like work.bake.work.sleep.repeat! Holy Heck Aimee! These are (1) gorgeous (2) genius and (3) my new favorite cheesecake! Gorgeous, as always! Love that you incorporated candy! Oh, I thought you were saying I am gorgeous 🙂 yes, candy is a must in cheesecake!! 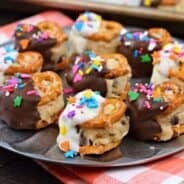 I too love to bake , I make mini cheesecakes all the time… I love using the 3 ingredient peanut butter cookie dough as crust then cheesecake then chocolate with broken mini peanut butter cups OMG is it good and in a pinch I use store bought cookies for crust and top with assorted candies …. oatmeal cookie dough crust and a dollop of strawberry is yummy too… made a layered cheesecake today brownie, cheesecake , brownie and cheesecake with chocolate gnauch covering it… cannot wait to try it … I use nothing but the best philly cream cheese last time it was onsale I bought 3 cases … I am down to half of a case left ….its only been a little over a month since I bought it ..
Oh my gosh! 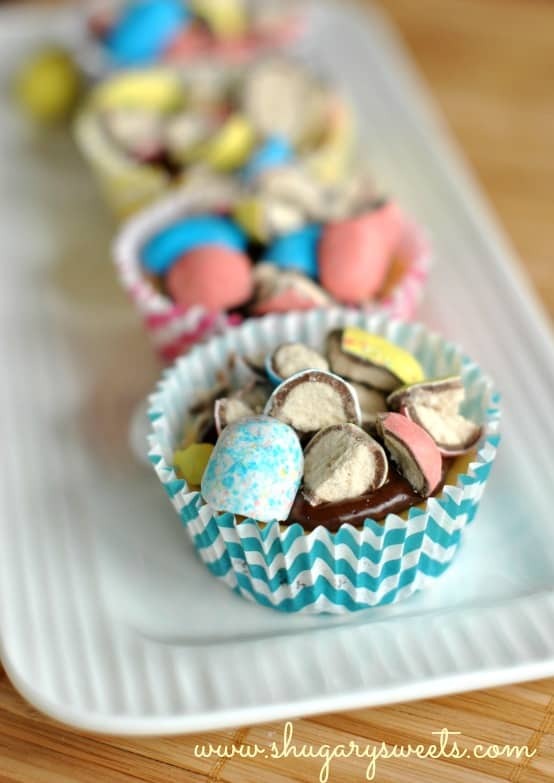 Everything about this recipe spells “cuteness”! And I agree — I’ve not baked enough cheesecakes. Time to change that! After spotting these babies on Instagram, I’ve been thinking about them ever since! No Easter is complete without malted milk eggs. Love them dearly! And these adorable cheesecakes.. too cute! These mini cheese cakes are soo cute! Interesting to hear about Philadelphia’s no preservatives as well. I have had my share of cheesecake ever since I worked in a gourmet cheesecake shop for a year and half. All day, everyday was cheesecake. But malt balls are my favorite candy so I think these recipe is in order to get over my cheesecake hating ways. I love Philly Cream Cheese! There isn’t any other cheese in my book! 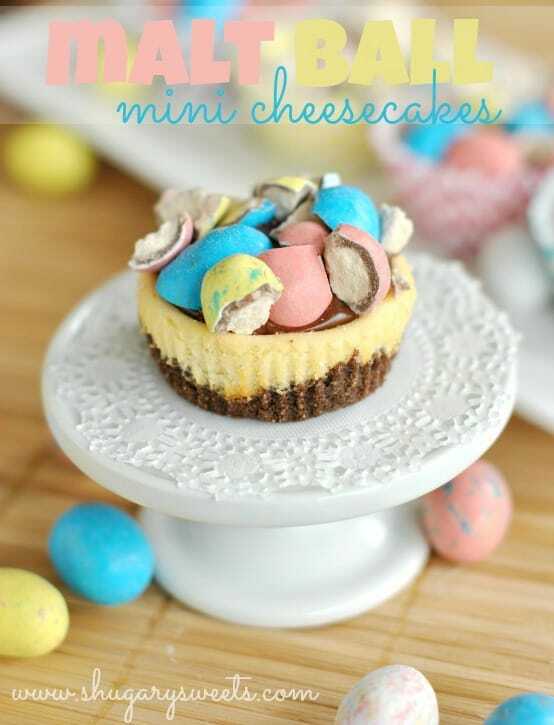 I love these mini cheesecakes with the Easter flair. SO CUTE!! These are so fun!! Yum! Oh God how cute! I was looking fos such cheesecake bites for ages! These mini cheesecakes are so pretty! They almost look like little colored eggs! Bravo! I love the idea of malt balls with cheesecake!! I need to give these a try! My girls are always begging for cheesecake! Gosh these look yummy. I just recently re-discovered easter malt eggs. I used to hate them because I ate them once thinking they were mini-eggs and got un-pleasently surprised. But man, they’re addictive! Oh man…the ganache on them looks amazing! Aaah, you all have such cute / yummy Easter candy in the US! Jealous. I LOVE anything malt flavored! These look so amazing, and that extra chocolate ganache on top is perfection! This looks so cute! Malt balls are really delicious. Pingback: 50 Pastel Desserts for Spring - Chocolate Chocolate and More! Can’t wait to try these. The reviews are pretty unanimous…..hopefully, the reviews one Easter match. Fingers crossed. I seriously struggle at cooking/baking. I once made pancakes that turned into tortillas (dead Serious!). I was feeling “fierce” one day and came across this recipe. I told myself I was going to try it, and take it to Easter to impress my BF family (I’m telling you….Fierce!) Anyway, It turned out AMAZING! So Thank you! One Problem, now his family thinks I can cook. They are all from the midwest and can make delicious things I have never heard of. Help! Oh my god, Just made these beauties. Loved the taste and the flavor of them. Very nice indeed. I’m not a big candy eater, but love malt balls and of course cheesecake. These are just wonderful! Definitely your malt ball cheesecakes with chocolate ganache are awesomeness! 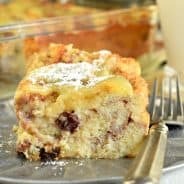 This is a great recipe Aimee, as you know I made it a short while ago and it was lovely, in fact have made it again since. Thanks for sharing! Haha, glad you enjoyed them, thanks for the sweet comment!